LOS ANGELES, California (CNN) -- Investigators are looking into whether employees at the Los Angeles County coroner's office illegally leaked information about Michael Jackson's death probe to the news media, according to a sheriff's spokesman. 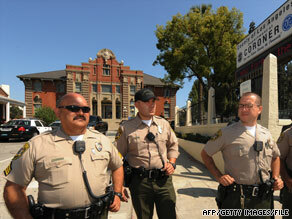 Police stand outside the Los Angeles County Coroner's Office when Michael Jackson's body was there in June. Vivid descriptions of Jackson's corpse, which was in the coroner's custody for an autopsy, were published by tabloid newspapers in the days after his death. The Los Angeles County Supervisors office on Friday asked the sheriff to conduct a "preliminary inquiry," which will determine whether there is enough evidence to launch a full investigation, said Steve Whitmore, a sheriff's spokesman. Whitmore did not provide details on what prompted the request. The Los Angeles Times quoted Los Angeles County Supervisor Mark Ridley-Thomas as saying his office called the sheriff's department after reports that coroner's employees not involved in the Jackson death probe had viewed his death certificate in the office database. Ridley-Thomas has not responded to CNN requests for comment. The coroner's office is investigating the cause of Jackson's June 25 death. It has been waiting on toxicology lab results, but a final autopsy report is expected as soon as next week, a coroner's spokesman has said. Los Angeles police are also investigating the death. Detectives traveled to Houston, Texas, this week to search the medical office of Dr. Conrad Murray, Jackson's personal doctor.